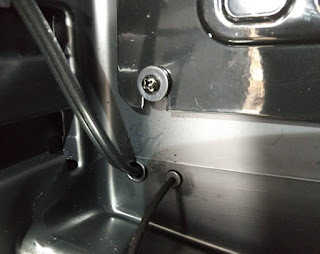 Warning: This post involves electrical work and other modifications that will void fridge warranties and could potentially result in bodily harm and/or property damage. Do Not attempt this build unless you fully understand the risks and are willing to accept the responsibility for those risks. Tramontina 126 Can Beverage Fridge - provides the insulated environment plus the cooling mechanism when current temperature exceeds the set temperature. The model I have is 80109/102. Ink-Bird ITC-310T-B Temp Controller -automatically switches on/off heating and cooling circuits in order to maintain desired temps. Brewers Edge Space Heater - provides gentle heat when current temperature drops below set temperature. The temp controller is mounted on the outside of the fridge, so I needed to find a way to get the probe inside. Likewise, the power cord for the heater needs to be outside of the fridge. Some people run their cords between the door and the body of the fridge, but this runs the risk of a leaky door seal and making the compressor work harder that it needs to, likely shortening compressor life. 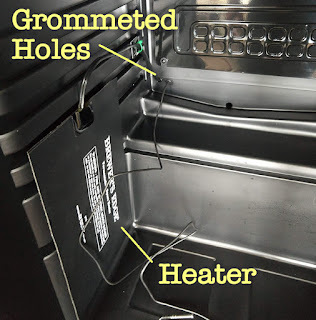 I prefer a clean look and tight seals, so I decided to drill two small holes in the back of the fridge, one for the temp probe, and one for the heater cord. Please note: This is where things can go horribly wrong if you're not careful. Long story short, you have to figure out a place where it's safe to make the holes while not damaging any cooling lines or wiring. To figure out where it was safest to drill, I visually inspected the fridge to get an idea of where the wiring and refrigeration lines were located. Next, I powered on the fridge and felt around the top and sides of the fridge to identify the location of the condenser lines. 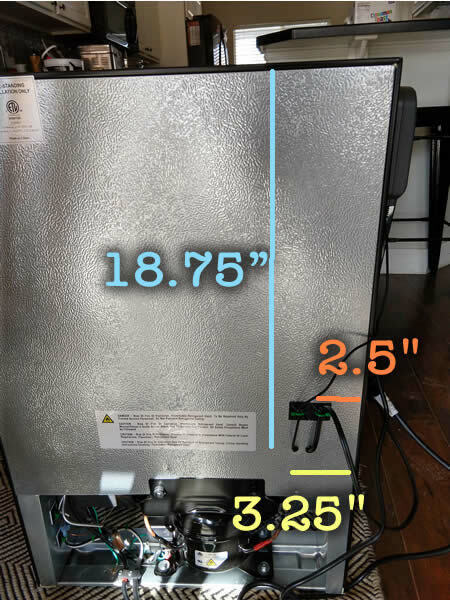 These fridges are similar to chest freezers; rather than having condenser coils on the back or bottom of the fridge, the condenser lines run just under the surface of the outer metal skin. Heat dissipates through the metal skin, resulting in warm zones on the fridge exterior. Feeling the exterior of the fridge, it was easy to feel the warmth coming off the upper sides of the fridge but nowhere else. So, based on my observations, there didn't appear to be any lines running through the top, the back, or the lower half of the side walls. For an added sense of security, I even used my laser thermometer to double-check and it was very easy to spot the temperature differential which was ~70F in the cool zone and ~90F in the warm zone just after just a few minutes. Now that I knew there weren't any lines running through the back of the fridge (other than the main ones coming right off the compressor) I just had to make sure I cleared the evaporator inside the fridge. Measuring from the rear of the fridge, I drilled the hole for my temp probe 18.75" down from the top, and 3.5" in from the right edge of the fridge. The hole for the heater cord was also drilled 18.75" down from the top, and 2.5" in from the side. These positions proved to easily clear the evaporator. A couple notes on drilling a fridge. Use sharp drill bits and start small. Drill carefully, just enough to pierce the metal exterior, then use a toothpick or a wooden skewer to probe the hole you just made. Make sure there are no wires or cooling lines present before you drill larger holes and/or all the way through. This is one time that it really pays to be cautious. Also, manufacturers sometimes make minor changes to fridge designs, so don't take the measurements I've provided as gospel; measure for yourself to make sure the size and positioning of components hasn't changed. 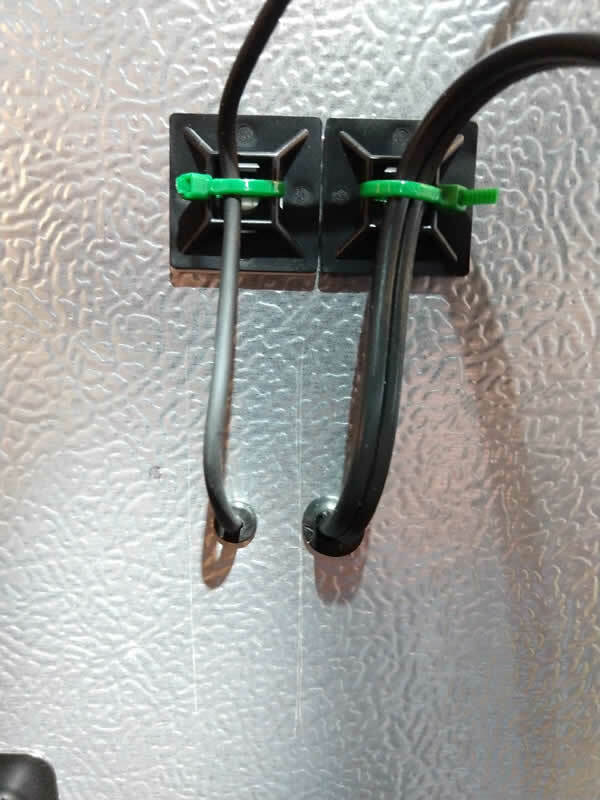 I used two grommets to protect the probe wire where it passes through the inner and outer wall of the fridge. A little bit of Armor-all on the probe and heater wires will provide lubrication and help the wires pass through the grommets more easily. Likewise, I used two slightly larger grommets for the heater wires. For these I actually used grommets without holes, and made my own figure 8 shaped hole using a hollow punch. If you don't have a hollow punch, I'd probably recommend using a sharp exacto knife to make a small slit. In order to allow the ITC-310T-B to control the cooling, we have to bypass the fridge's internal thermostat. Often people will do this by setting the thermostat to the coldest setting, then simply plugging the fridge/freezer into the controller. In this scenario, the controller cuts off all power to the fridge when it isn't actively cooling. 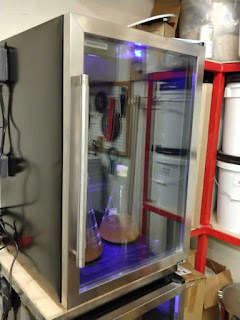 The only problem with this approach is it doesn't allow you to use the LED or the digital temp display inside the fridge when the fridge is powered down. To get around this, I chose to completely bypass the internal thermostsat. I accomplished this by adding a new/second power cord that is connected directly to the compressor and switched on/off by the ITC-310T-B. 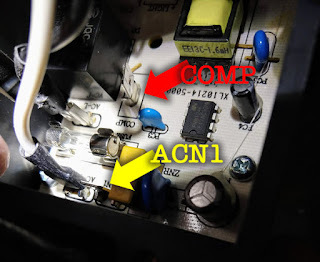 The compressor has two wires going to it, a white (neutral) and a black (hot), so this connection is really easy. 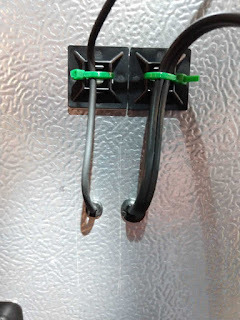 Removing the black plastic electrical box cover at the back off the fridge revealed a circuit board where all wiring connections are made using spade terminals. The black wire connected to the compressor is connected to the COMP terminal, and the white wire is connected to the ACN1 terminal. Disconnect these two wires from the circuit board and separate them from the rest of the wiring harness. Next, connect the corresponding white and black wires from the new power cord to the white and black wires that run to the compressor. In order to maintain the OEM wiring, I simply crimped on male spade terminals into the new cord. The new cord was then secured in the stress relief fitting next to the original cord. For safety, don't forget to ground the new cord (green wire). Also don't forget to reinstall the black plastic electrical box so that the circuit board is protected. Plug the new cord into your temp controller, and plug the original cord into an always-on power supply. With this setup, you'll be able to use the blingy blue LEDs and digital temp display in your fridge in conjunction with the temp controller. 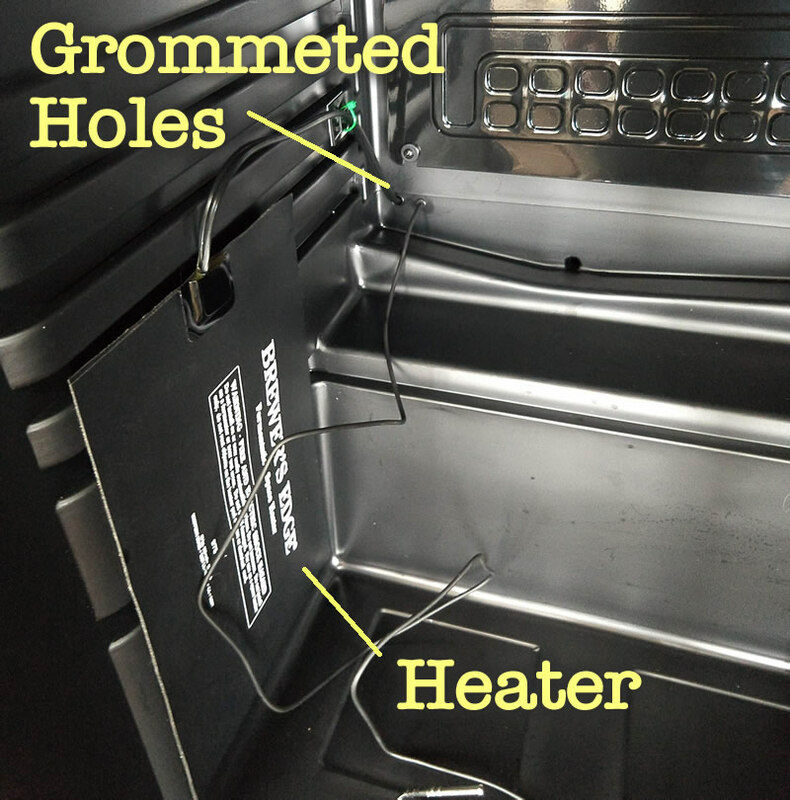 Also, because it didn't destroy any connections, the whole process is reversible in case you decide you want to return the fridge to its original state (minus any holes you've drilled). 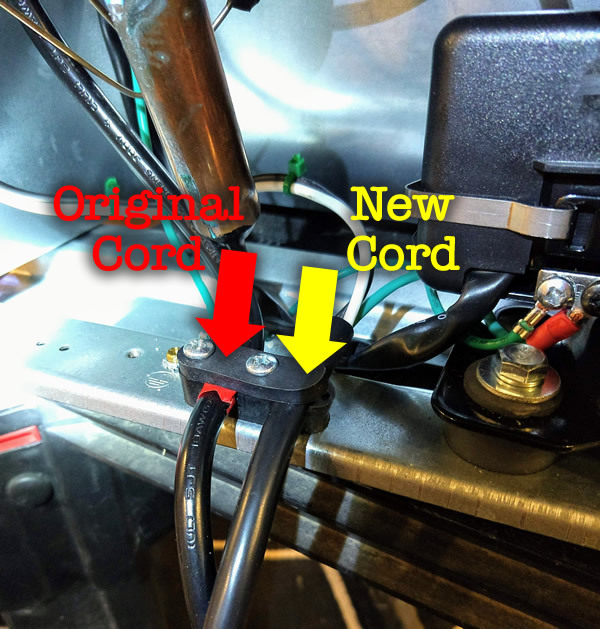 It should be obvious, but Do Not plug the new cord directly into an always-on power supply...because this will mean the compressor will always be running, or at least until it suffers a premature death. That's about all there it's to it. I probably spent twice as much time measuring and making sure I wasn't going to damage anything as I did making actual connections. I know I sound like a broken record here, but be careful with the drilling. It would be a shame to lose a brand new fridge to a mistake. Also, if you're unsure of any of the wiring connections, consult someone that has electrical experience. Original fridge cord is plugged into an always-on power supply. New fridge cord it's plugged into the Cooling circuit of the ITC-310T-B. The power cord for the heater is plugged into the Heating circuit of the ITC-310T-B. The ITC-310T-B is plugged into an always-on power supply. 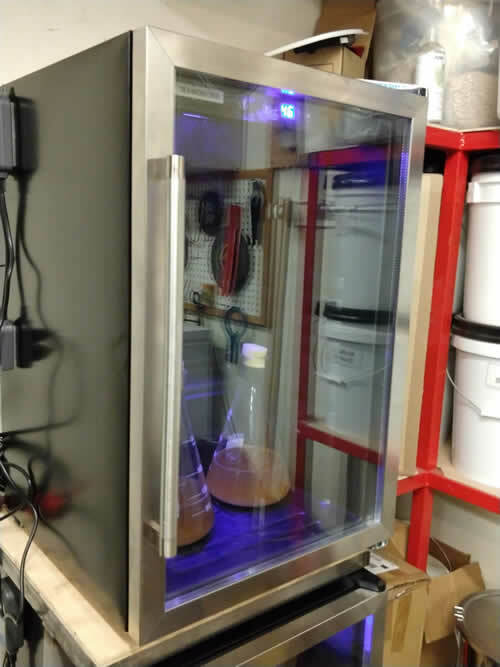 Set your temp controller to the desired fermentation temperature. Here are a few more pictures. Cheers!